Our Objective What we do. What we believe Pastor Clayton's Corner Key staff members. 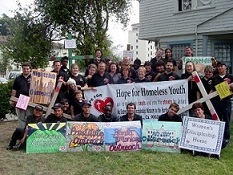 Multiple outreaches to Santa Monica, Hollywood, Venice Beach, South L.A., and the Red Light District. When appropriate we refer and advocate for placement of homeless youths and others we meet during our outreaches to community colleges, adult school, vocational training, rehabilitation centers or programs. On a select basis we house youths at one of our transitional living facilities and mentor them as they get back into society while holding a job, going to school or attending some sort of vocational training. Refurbishing computer equipment and salvaging E-waste to benefit homeless youths and the low income community. On a select basis we give computers and laptops to kids, youths and adults going to school or vocational training. We provide low cost computer systems to persons receiving any type of state, local or government aid. Computer & Donation Center: S. Normandie Ave. & 51st St., Los Angeles, Ca.